A reflecting omnidirectional optical system with four spherical and aspherical mirrors, for use with long-wavelength infrared light (LWIR) for night surveillance, is proposed. It is designed to include a collecting pseudo-Cassegrain reflector and an imaging inverse pseudo-Cassegrain reflector, and the design process and performance analysis is reported in detail. The half-field of view (HFOV) and F-number of this optical system are 40-110° and 1.56, respectively. To use the LWIR imaging, the size of the image must be similar to that of the microbolometer sensor for LWIR. As a result, the size of the image must be 5.9 mm × 5.9 mm if possible. The image size ratio for an HFOV range of 40° to 110° after optimizing the design is 48.86%. At a spatial frequency of 20 lp/mm when the HFOV is 110°, the modulation transfer function (MTF) for LWIR is 0.381. 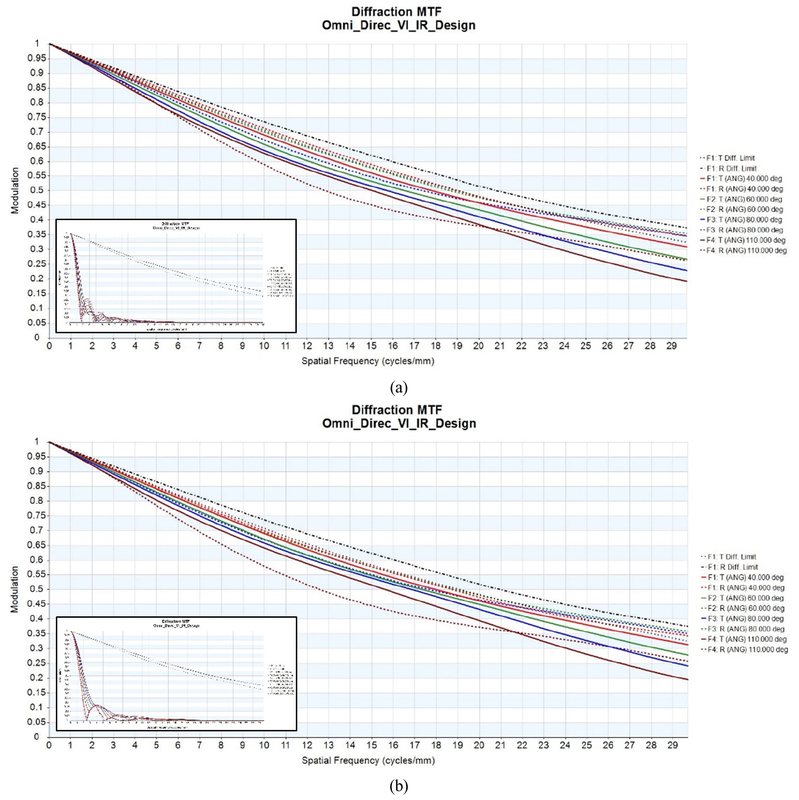 Additionally, the cumulative probability of tolerance for the LWIR at a spatial frequency of 20 lp/mm is 99.75%. As a result of athermalization analysis in the temperature range of -32°C to +55°C, we find that the secondary mirror of the inverse pseudo-Cassegrain reflector can function as a compensator, to alleviate MTF degradation with rising temperature. 야간 감시를 위해 원적외선에서 사용하는 4개의 구면 및 비구면 거울을 갖는 반사식 전방위 비전 시스템 광학계를 제안한다. 이 반사식 전방위 비전 시스템은 유사 카세그레인식 수광부 반사경 시스템과 역 유사 카세그레인식 결상부 반사경 시스템으로 설계되었으며, 그에 따른 설계 과정과 성능 분석을 상세히 제시한다. 이 비전 시스템의 반화각과 F-수는 각각 40~110°와 1.56으로 설정하였다. 그리고 원적외선 파장 영역에서 비전 시스템을 사용하기 위해서 상의 크기가 원적외선용 마이크로 볼로미터의 크기와 가능한 같아야 하므로 상의 크기를 5.9 mm × 5.9 mm에 맞추어 설계를 진행하였다. 최적화 설계 후 40~110°의 반화각 범위에서의 상 크기의 비율은 48.86%이며, 나이퀴스트 주파수인 20 lp/mm의 공간주파수에서 원적외선의 변조전달함수 값이 0.381에 도달하였다. 또한 20 lp/mm의 공간주파수에서 원적외선 영역에 대한 공차의 누적 확률은 99.75%였다. 또한 역 유사 카세그레인식 구조의 결상부 부경을 온도 변화에 따른 변조전달함수 값을 개선시키는 보상자로 선택하여 반사식 전방위 비전 시스템의 운용 온도 범위인 -32°C에서 +55°C의 온도 범위에서 비열화 해석 및 보상화 과정을 진행하였다. We investigate the signal-to-noise ratios (SNRs) of time-domain (i.e. pulsed illumination) and frequency-domain (i.e. chirped illumination) photoacoustic signals measured by a spherically focused ultrasound transducer for spherical absorbers. The simulation results show that the time-domain photoacoustic SNR is higher than that of frequency-domain photoacoustic signals, as reported in the previous literature. We understand the reason for this SNR gap between the two measurement modes by analyzing photoacoustic-signal spectra, considering the incident beam energy controlled by the maximum permissible exposure. As the result of this approach, we find that filtering off the DC term in the chirped signal’s spectrum improves frequency-domain photoacoustic SNRs by up to approximately 5 dB. In particular, it is observed that photoacoustic SNRs are highly sensitive to an upper-frequency value of frequency filtering functions, and the optimal upper-frequency values maximizing the SNR are different in time- and frequency-domain photoacoustic measurements. 구면 초점 초음파 측정기에 의해 구형의 광 흡수체로부터 측정된 시간(즉, 펄스 형태 광원) 및 주파수 영역(즉, 처프 형태 광원) 광음향 신호의 신호 대 잡음비(signal-to-noise ratio)를 이론 및 시뮬레이션으로 분석하였다. 이전 문헌과 마찬가지로 시간 영역 광음향 측정에 의한 신호 대 잡음비 값이 주파수 영역 광음향 측정의 경우보다 더 높았는데 이 근본적인 이유를 최대허용노광량(maximum permissible exposure)에 따른 광원의 세기와 주파수 필터링을 통한 두 측정 모드의 광음향 스펙트럼들에 대한 분석을 통해 이해하였다. 또한, 분석의 결과로서 주파수 영역 광음향의 처프 형태 광원에 대한 정합 필터링에 더해 DC 스펙트럼 부분을 제거하니 신호 대 잡음비가 5 dB 정도 상승하는 것을 발견하였다. 특히, 주파수 필터 함수의 주파수 상한 값의 변화에 따라 신호 대 잡음비 값이 급격하게 변동하였는데 신호 대 잡음비가 최대가 되는 주파수 상한 값이 두 광음향 측정 모드에서 서로 다르게 나타남을 관찰하였다. 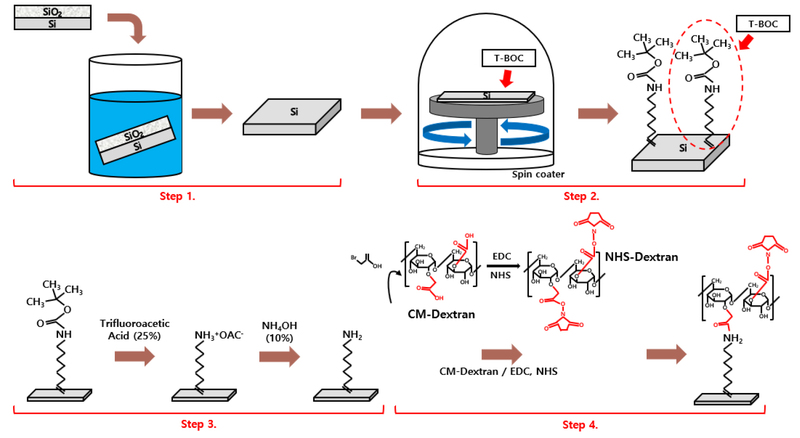 We report highly sensitive detection of myocardial infarction biomarkers, such as myoglobin and cTnI, within several hundred seconds using a rotating-analyzer ellipsometer and a biosensor with biochips fabricated on a SiO2-coated tilted silicon substrate. We choose the running buffer to be pure phosphate-buffered saline (PBS) or 10% mixed human serum. When we choose the running buffer to be pure PBS, we obtain diagnostic densities of pure myocardial infarction biomarkers of up to 1 ng/ml and 5 pg/ml respectively. Meanwhile, when we use PBS with 10% human serum, the measured densities of myoglobin and cTnI were up to 1 ng/mL and 1 pg/mL respectively. The measured diagnostic densities are less than 1/15 and 1/80 (in cases of myoglobin and cTnI respectively) of those referenced by the World Health Organization. 2° 기울어진 산화막 코팅 실리콘 기판의 바이오칩과 프리즘으로 제작한 바이오센서와 검광자 회전 타원편광계를 이용하여 심근경색 생체표지자인 미오글로빈과 cTnI의 진단 농도를 수백 초 내에 실시간 초고감도로 측정하는데 성공하였다. 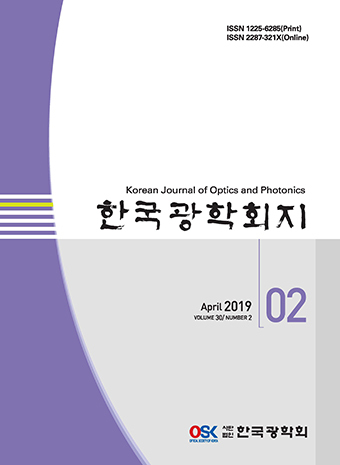 러닝 버퍼로는 순수한 phosphate buffered saline (PBS) 또는 PBS에 10% 인간 혈청을 섞은 러닝 버퍼를 사용하였다. PBS 조건에서는 미오글로빈과 cTnI가 각각 1 ng/mL와 5 pg/mL로 측정되었으며, PBS에 인간 혈청을 10% 섞은 조건에서는 미오글로빈과 cTnI는 각각 1 ng/mL과 1 pg/mL로 측정되었다. 이러한 심근경색 생체표지자의 진단 농도는 현재 제시된 세계보건기구의 심근경색 진단 기준 농도보다 미오글로빈은 1/15배 낮고, cTnI는 1/80배 낮다. In this paper, we investigated the sensing ability of an extraordinary optical transmission sensor, which is based on the diverse configurations of highly ordered structures. The diverse nanostructures of subwavelength hole array were designed to have different periods and lattice configurations of the array. 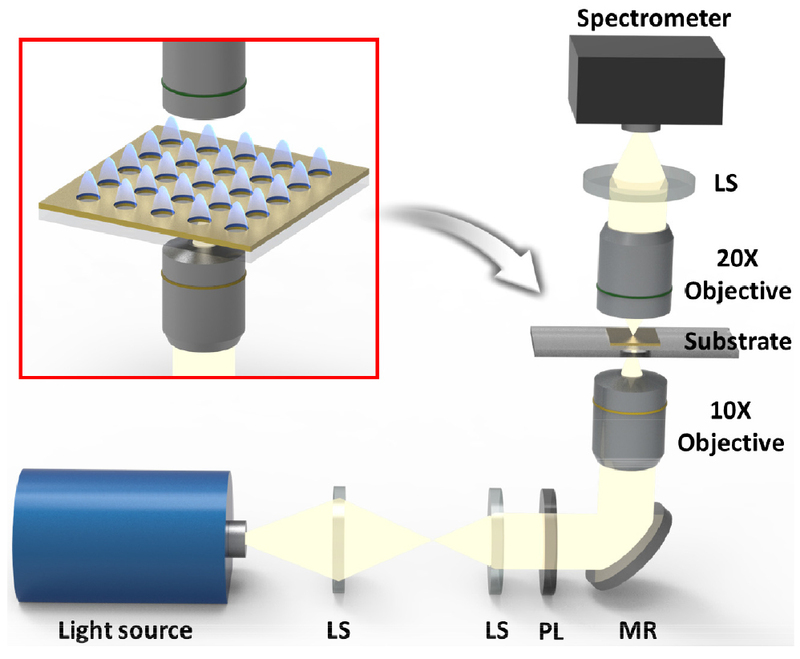 To verify the sensing ability of the sensor, we measured the transmittance spectra of samples (n = 1.333, 1.363) for diverse configurations of substrates. The measured transmittance spectra of diverse materials with different refractive indices show that the sensitivity increased as the period of the structures increased. Also, improved sensing performance of the sensor was achieved for the square array, compared to the hexagonal array. 본 논문에서는 다양한 배열을 가지는 기판에서의 특이 광 투과 센서 시스템의 센싱 성능을 조사하였다. 보조파장 홀 어레이 구조는 어레이의 주기와 격자 배열을 달리하여 제작하였고, 특이 광 투과 센서 시스템으로 제작한 기판에서의 투과 스펙트럼을 측정하였다. 굴절률이 다른 유전물질을 이용하여 투과 스펙트럼을 관찰한 결과 어레이의 주기가 증가할수록 센서의 민감도가 높아짐을 보았다. 또한 육각형 어레이에서 측정한 결과와 비교하였을 때 정사각형 어레이에서 센서의 성능이 향상됨을 입증하였다.